(Attention: This is a very technical post mostly for Python developerts. If you are not a programmer you might want to skip this). During a conversation esp. with Ryan Williams (Which Linden) from Linden Lab we talked about their own Python libraries eventlet and mulib and how great it would be to have them available as Python Eggs (eventlet is a co-routines based networking library and mulib is a REST framework build on top of it. Both are used internally by Linden Lab for the Second Life infrastructure). If you don’t know what a Python egg is, it’s simply a way of distributing Python packages, similar to RPM. There is also an easy method of installing them, using easy_install. Where do I find Python Eggs? You can find Python Eggs on quite a few places on the web, e.g. at a package author’s website. The biggest repository of eggs is the Cheeseshop (or PyPI) though), an index for Python packages. In order to be able to install eggs you simply need to install easy_install which is easily done by downloading ez_install.py (you can download it here) and calling it (you need to have rights to install components in your python installation of course). and it will download and install the most recent version. If you are not running as root and you have Python installed as root you of course need to use something like „sudo easy_install“ instead (e.g. on MacOSX). A great additional feature is also that Eggs can define dependencies on other packages which easy_install will then try to automatically download and install aswell. BTW, the easy_install program is part of the setuptool package by Philip Eby and is based on the distutils package which is part of the standard python distribution. 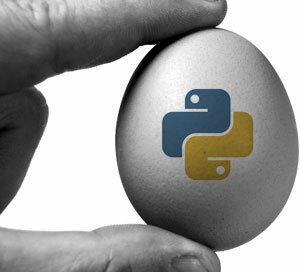 Now we know how to install Python Eggs, how can we actually create them? There are actually two ways to do that, one is more manual and the other directly creates a skeleton for you to work with which might be handy for projects you start from scratch. This will build and install the library in your Python installation. You need to make sure you have greenlet installed though. So we can see some metadata about this package, like name, version, description, author and so on, but also a list of packages to be installed. In this case it’s „eventlet“ and this means that the directory „eventlet“ on the filesystem will be used as the package to install so you later can say from eventlet import .... The directory eventlet will be what will be in your PYTHONPATH. Now so far it’s great but we might miss some features of eggs here, namely the ability to package it as one file, to register it with the cheeseshop and to define dependencies. So to add this we have to do just a few changes to setup.py. (actually I haven’t checked the license of eventlet/mublib so this might be wrong but you can change this accordingly). So we added those classifiers to put it into the right categories on Cheeseshop and most importantly we added the requirement „greenlet“. If you then install the egg setuptools will automatically install greenlet as well. You can check the contents by calling unzip -t eventlet-0.1-py2.4.egg and as you can see it’s basically the contents of the eventlet directory plus an EGG_INFO directory with metadata. Also included are the .pyc files as it’s a binary distribution. The resulting .egg file can now be distributed by whatever means and installed by the above easy_install command. If you just want to start your project there is an easier way to create the initial structure. You simply use Python Paste and a template. What we are interested in is especially paste.script which is some sort of template based automation system. but ZopeSkel will install PasteScript as well and offers additionally templates which might be of use to you. nested_namespace:   A project with two nested namespaces. The interesting ones for Python are basic_package and basic_namespace. We will use basic_package for now as it creates a package ready for egg distribution. and it will ask us a lot of questions, basically all the metadata we have to put into the setup.py file. After it’s finished you should have a new directory with a basic egg supporting structure. Now you just need to code your actuall component but that’s left as an exercise for the reader!